Tomorrow will be exactly nine months from the day we announced our purchase of the Lasso intellectual property with the intent of significantly rejuvenating the community and the language of Lasso. Today we had an internal celebration over the many things we have accomplished: from documentation and reference material, to improvements and tweaking of the language itself, to a new website and marketing materials galore. We have found that the list of things to do hasn't gotten shorter: it is now filled with new ideas and vision, and has tripled in length. I said at the beginning - even nine women can't make a baby in one month. It has taken significantly longer to get to where we are than I had hoped. But now here we stand - after the gestation period I originally referenced - and have done nothing but clean and tweak and massage. We haven't seemingly done anything new. However, one of the things we promised to do early on in our new tenure - as noted in my last post which was also released today - was to ensure our community's code would retain its value and enabled our community to use all past code. We have held steadfast to this ideal by working with old code and literally going through community code and checking the vintage syntax manually for compatibility. However, we have even bigger news. Our first new brain child is born. As noted some time ago, we have been applying additional effort beyond just the backwards compatibility efforts to date into a Black Swan - something which should help maintain the value of old code more than anything else to date. We thought carefully and deeply about how we could maintain the value of old code while providing a mechanism to move to a more modern syntax. And once again, from the depths of the brain of Kyle, we found a brilliant answer. 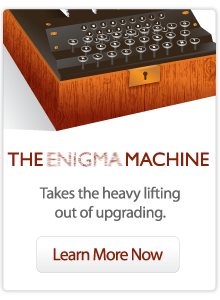 The original Enigma machine was a tool developed by the Germans in WWI to encrypt messages to one another though a complex analog device. It enabled the transformation of what seemed to be a jumbled code into something readable by a human being. In WWII, it became a critical strategic step for the Allied forces when they were able to decipher code sent by the Germans. As both of my grandfathers were officers in the Canadian Army during WWII, I am pleased to remind people of the importance of this tool to our livelihoods today, and hope that our new tool will have a similar significant effect on our overall fight to make Lasso a significant player in the language market. If it is our battle to win people to the Lasso community, I hope this tool helps us win the war. Unlike the old Enigma Machine, ours wasn't built with wood and wires. What has been achieved here, I did not believe could be done. I am still astounded. What was done here amounts to one thing: coding witchcraft. You can now go to the following URL: http://www.lassosoft.com/Enigma and insert your older code for automatic conversion from Vintage Syntax to Modern Syntax. At this time, we are limiting the number of requests and lines of code you can enter through the online mechanism. *Note that we will be making the restrictions much more lenient for CLDs who are logged in. This experiment will currently take your Lasso 8 code - or an example tag - and make it functional and useful Lasso 9 code. This should significantly help you should you choose to adopt Modern Syntax in many ways. You can easily learn about smaller chunks of code by posting and checking. You can take older tags and older bites of code and automatically convert them. Our primary goal for this online tool is to help people better understand what modern syntax should look like in the context of their own code. It should help people understand the difference in syntaxes and make the transition from one to the other - should they choose to do so. Please, try out some of your older code and let us know how it works for you. Although we are not officially releasing this today (as we wish to get feedback on the mechanism itself first), we also have a Mac OSX version which will batch process an entire system into Modern Syntax. This version has other options, for example, automatically allowing for small samples of embedded code to make code more readable. Once the online version has been tested appropriately, this app (for sale on the Lasso store) should allow developers to process significant amounts of older code and re-use any code they have written over the past many, many years. Later versions will also allow for the cleanup of Lasso 9 Syntax itself into a common standard, making it easier to share and read. 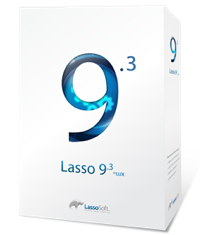 You can pre-purchase the MacOSX version on the Lasso store today for an introductory price of $599 - that's a $100 savings off our retail price. If you do take up this offer now, we will send you a Beta version as soon as it has been thoroughly tested, and your choice of a Lasso Enigma Machine TShirt. Thank you for sticking with Lasso for the last 9 months. The best is yet to come.